Looks can be deceiving, and for music, the same could be said when first listening to an album. 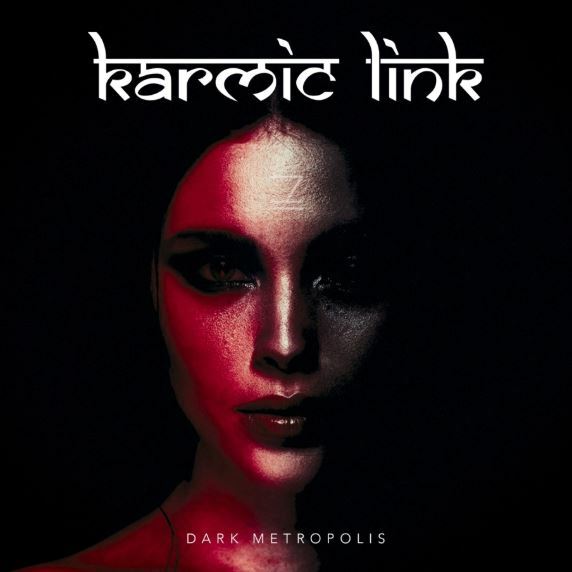 From Linköping, Sweden, comes Karmic Link’s 3rd album Dark Metropolis, a full 8 years after their last album came out. Karmic Link is a progressive/gothic metal act that closely mimics electronic/industrial metal bands like later-era Godkiller, or Samael. Like most new albums of bands that I’m not too familiar with, I went in blind with indifferent expectations, other than intrigue as I have never heard anything under this type of sub-genre. My expectations were practically warped beyond recognition, as I was initially baffled by the cavalcade of quirkiness and eccentricity that punctuate this album. To begin with, the beginning (and the rest to an extent) of this album is so flabbergasting, musically speaking, that it unfortunately put a morose and dreadful taste in my mouth. The opening track ‘Random Phantom’ caught me off guard, due to the heavy hip hop/synth-wave style presented, which sounded like it took a hefty influence form the ‘Hotline Miami’ soundtrack, once again characterized by synthetic, catchy rhythms. And while the hip hop style is majorly contained to the album’s opener, there is a surprising amount of funk scattered throughout the songs. ‘The Tone of C’ is especially noteworthy, as it conveys a sound of 80s synth pop and funk so cheesy, complete with drum portions soloed out along with synths and bass. It’s as if the B-52s took a stab at writing a metal song, and in all honesty, it’s such a novelty that it kind of works, and this adds to what makes this album unique. There’s such a disconnect not only in musical styles, but tone as well, with ‘The Tone of C’ having a cheery, positive tone, to the album’s closer, ‘Nostalgia’ having a gloomy, doom like melancholy to it. Luckily this disconnect only drags down the album in two to three songs, but the brunt being the first two songs. The first couple songs are so candidly bad, ranging from below mediocre to awful, that you might be tempted to turn the album off. That being said, the rest of the album provides rather enjoyable listening experience. The only other track with a severe disconnect is the two minute, instrumental track ‘Riama’ which starts out with some decent and moody piano lines, but then gets right back into the funk, but not too heartily, but enough for me to skip it. There were other styles used as well, thankfully those I could draw positive connections to other pieces of media. Some of the synths in the track ‘Your Fire Will Burn for Centuries’ reminded me of 80s horror movie soundtracks, particularly the ‘Day of the Dead’ soundtrack with its dim and damp closer, and earlier in the song, some reminders of 2010s synth-pop, which all in all is a guilty pleasure of mine. Even ‘False Spots on the Highway’ added in some atmospheric pan flute synths which instantly suckered me in with their tribal and ambient sound. As I mentioned it before, ‘Nostalgia’ adds in gloomy feelings of memories and is easily the best track on the album and a great closing piece, in its nihilism and sense of loss, accentuated by the ambient organ. With all the stylistic choices made, this album feels like a retro tribute to the 80s and new wave music in general, rivaling Ministry’s With Sympathy. And while this album identifies with the quirks and horns of the 80s synth vibe in general, the majority of the album feels like a modern take on it, rather than being dated and sounding like this was written in the 80s. It’s not particularly fast or aggressive, but takes its time in presenting the pieces written, even if they aren’t that good. That being said, there are still more aspects of the album that leave much to be desired. Gothic vocals are a tricky performance to pull off, especially depending on the style of music that influences the album, and Stathis Kassios, gives it his all, but falls a bit flat in keeping me interested for some parts, evident on the track ‘Endless’. And speaking of interesting, the lyrics are nothing of note as well, not being extraordinarily written, not to mention being much too repetitive. There is a theme of being lost and helpless however, dotted with feelings of contempt and a need for revenge, though these are not notably well done. Nothing too complex or technical is exhibited by the instruments, but Hensley and Gustavsson are excellent in performing their respective parts. And while Kassios doesn’t quite excel at vocals, he exceeds in keyboards, which for the most part steal the spotlight, and make this album for me. Dark Metropolis is strange, and to be frank, I like strange. While it lacks in consistency, lyrics, and somewhat vocals, it makes up for in other performances, retro stylistic choices, and surprisingly effective tonal shifts. Would it make my top 10 of 2018? It’s a definite maybe, as competition is fierce, but the album remains superb in its quirks. A definite recommendation.